By February 18th, someone making $1,000,000 in 2019 will have stopped paying into Social Security for the year. Social Security, which provides retirement, disability, and survivor benefits to countless Americans every year, only taxes the first $132,900 of a salary (up from $128,400 in 2018). If you make more than this cap, that income is not subject to the tax. Most people in the United States make less than $132,900 per year, so they will pay the 6.2 percent payroll tax every time they get a paycheck in 2019. Those who make over $132,900 get a break on any income above that amount. If a person made $50,000 in 2019, for example, they’d pay taxes until December 31st — and have an effective tax rate of 6.2 percent. But someone making $1,000,000 in 2019 would stop paying Social Security taxes on February 18th and see a bump in their pay afterwards. This person’s effective tax rate would be just 0.8 percent. The burden of Social Security taxes falls more heavily on those who make less. Social Security’s finances also depend on the tax cap. Social Security is projected to have a shortfall in the medium term and many argue that the program, despite its importance, needs to be cut today. Part of this shortfall is because more money has been shifted above the $132,900 cap over the last few decades: in 1983, 10 percent of wage income was over the cap; in 2016, over 17 percent was. This change represents a large share of the shortfall. Scrapping the payroll tax cap entirely and making everyone pay the same tax rate, together with modest changes to the program (or a shift in perspective from deficit politics), could eliminate the shortfall entirely and allow for expanding benefits, which are as necessary as ever. 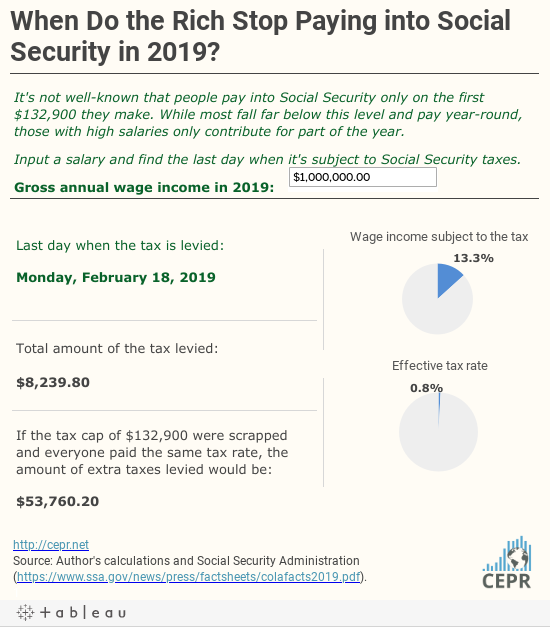 To better illustrate these points, CEPR has updated the calculator below (also available here) which shows the last day when salaries, if spread evenly throughout the year, are subject to Social Security taxes. It also displays how much taxes are levied based on current law, and how much would be levied if the payroll tax cap were scrapped. $10,000,000: This is income at which Representative Alexandria Ocasio-Cortez’s proposed 70 percent marginal tax would take effect. $1,500,000 and $21,800,000: This is the estimated wage income of billionaire Howard Schultz, former CEO of the coffee chain Starbucks. Although no longer CEO of Starbucks, he was on track to receive a similar salary in his retirement. His last known salary totaled $21,800,000 (with a $1,500,000 base salary). Schultz is in the news as he recently decided to explore running for president in 2020. Schultz has, in the past, distinguished himself with his focus on deficits and debt. Part of this focus has included cuts to Social Security and Medicare. It’s important to note that Social Security taxes only apply to wage income and not to other types of income, like investment income. As incomes rise, wage income often becomes eclipsed by investment income — which under current law, is not subject to Social Security taxes.